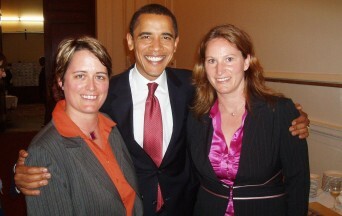 Deborah Mizeeur (left) with wife Heather and President Barack Obama. Heather Mizeur, a lesbian member of the Maryland House of Delegates, said she’s seriously considering a run for governor in an exclusive interview with the Washington Blade this week. A run by Mizeur would mark another key milestone in the LGBT rights movement. If successful, she would be the first to win election as an openly gay candidate for governor in the country. Former New Jersey Gov. Jim McGreevey announced he is gay and then promptly resigned from office in 2004 after disclosing he’d had an extramarital affair with a male adviser. Posted November 15th, 2012 & filed under Politics.